The beautiful thing about hosting a pirate festival at a museum is that it’s already largely predecorated. Actually, that only works if it’s the right sort of museum – Burlingame Museum of Pez Memorabilia, for example, might be a poor fit. But the National Civil War Naval Museum provided a splendid backdrop for 2010 Southern Pirate Festival, which their website accurately described as “One Day of Family Fun & History” followed by “One Night of Debauchery.” Truly, something for everyone! 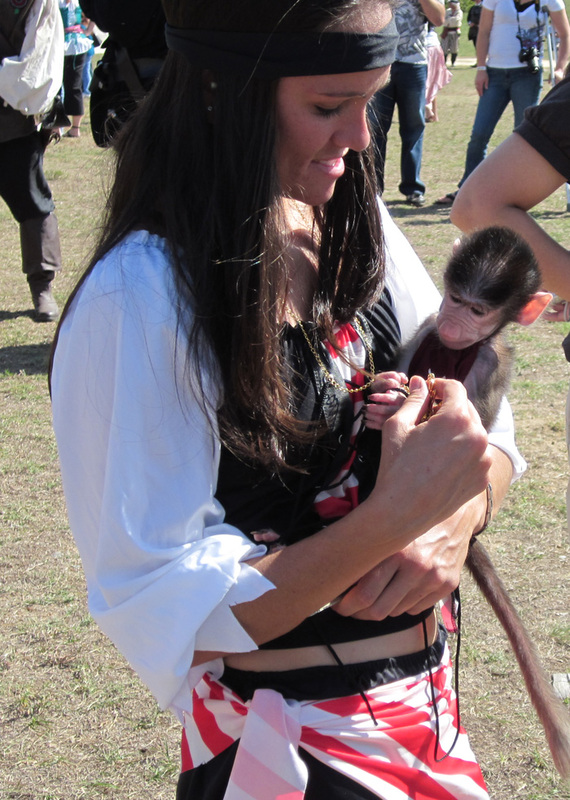 This festival had monkeys! 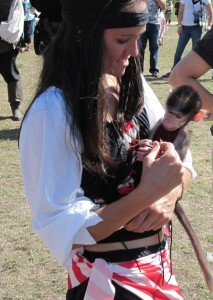 Seriously, monkeys!!! 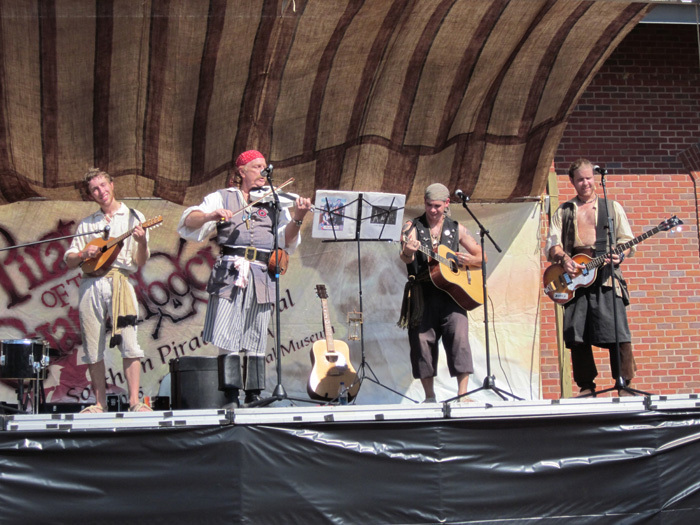 While performers, reenactors, and other participants in the festival began to filter in (and hit the rum) throughout Friday night, The Southern Pirate Festival this year was constrained to a single day. Beginning gently on Saturday morning, patrons were quickly drawn to the vast assortment of goings on in the field behind the museum (indeed, those of us inside saw nary a soul for this first while.) The outside of the museum consisted of a pirate encampment complete with weapons demonstrations, historical education, and of course vendors selling everything from swords to mugs to Hot Pirate Babe Calendars (available for purchase directly from calendar photographer Tiger Lee and the lovely Caribbean Pearl.) Cannon’s were also fired sporadically, which surely woke up any sleeping populace for miles around (Civil war cannons being a good deal larger than the smaller, Golden Age many of us are accustomed to.) There were also a couple of pirate invasions, which I sadly missed as I was distracted elsewhere, largely with my DJ duties inside the museum. For those unaware, the Civil War Museum isn’t so much a collection of displayed goodies as a recreation of the era’s dockside experience. Indeed, one entire room is meant to recreate exactly that – a civil war dock complete with water, sky, and a docked battleship. And while the ship in question is an 1800’s ironside rather than a 1700’s trimasted spanish galleon, it would be the poor sport that saw fit to complain. Other parts of the museum mimic the belowdecks of a ship – crew quarters, captain cabin and the like. And then, of course, is the main stage which bears a striking resemblance to the deck of the USS Monitor – my home for much of the day (family fun) and evening (debauchery). 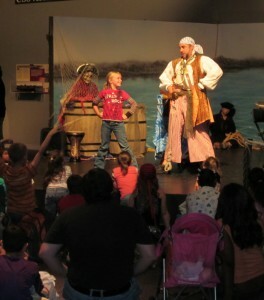 Billy Bones instructing a younker on how to strike a piratey pose. Festival entertainment could be found throughout the day on the main stage, as well as an outdoor stage on the festival grounds and other select locations within the museum. 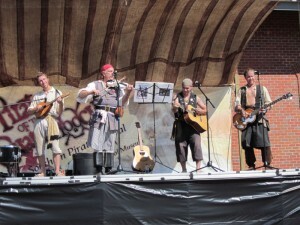 The Brigands cranked out several shows, sharing a quasi-period, irreverent take on pirate and shanty tunes. Willoughby Caught took what on the surface seemed a gentler approach, although careful listeners would be aware that her music isn’t always as tame as it might appear on the surface. Billy Bone’s Pirate School was a new one by me – but his witty banter and easy way on the stage made him an instant hit with the children and their parents alike. 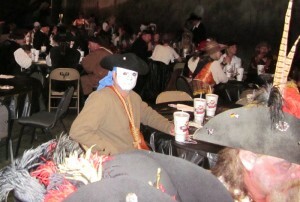 The Undead Buccaneer's Ball had many a spooky pirate. And booze. The daytime activities were plenty fun, but as is often the case, it was in the evening that the public bowed out, and the pirates could properly party amongst themselves. The Undead Buccaneers Ball featured dinner, drinks, and dancing. The main stage was shared again by The Brigands, Willoughby Caught, and myself. The schedule was a bit overbooked and a tad chaotic, but everyone managed to have a great time, complete with costume contests, announcements and honors, and even some impromptu poetry from Billy Bones. I myself was able to play some extremely varied DJ sets, including a segment of pirate house paired against some more “traditional” pirate-core. 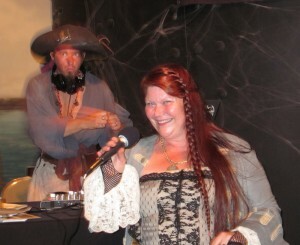 Willoughby Caught sings along to her own music while DJ Bilgemunky gets his groove on. The Southern Pirate Festival was a fantastic day. Local public and pirates alike shouldn’t hesitate to attend next year. Long distance pirates would also do well to keep this one in their sites – the small vending area and one-day format might prove a bit small to justify a longer journey, but the right elements are all in place, and there’s already talk of expanding for 2011! This entry was posted in Commentary and tagged after action reports, bilgemunky live appearances, southern pirate festival by Bilgemunky. Bookmark the permalink. This was an awesome event. Had the time of my life there. Make sure you pyrates put this one the calender for next year. Not only was the entertainment good….But the food was really good. The Southern Pyrates Festival really knew how to put on an event with their southern charm.